Boston Celtics' Gordon Hayward speaks to members of the media, Thursday, Sept. 13, 2018, at the team's NBA basketball practice facility in Boston. Hayward is working his way back from a broken leg. The Celtics were in sunny Los Angeles, it was another sub-zero winter day back in Boston, and Gordon Hayward was stuck in rehab, shooting baskets from a chair and picking up marbles with his toes to work his surgically repaired ankle back into shape. Other players did their best to keep up his spirits: One time, Aron Baynes brought back some Krispy Kreme doughnuts from a road trip and drove them over to Hayward’s house. 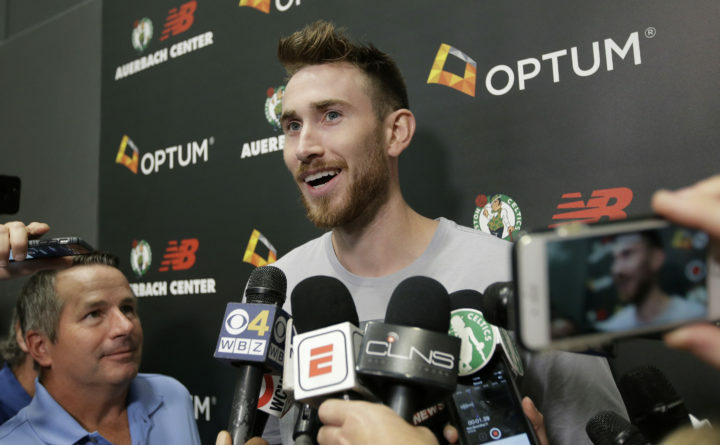 Speaking at the new practice facility named for Red Auerbach, Hayward said he celebrated each bit of progress — the walking boot coming off, or shooting baskets standing up, instead of sitting in a chair. Within the past two weeks, he has been able to play five-on-five basketball.